We were very fortunate to have visited the GM Flint Truck Assembly Plant in August of 2011, and the Ford Kentucky Truck Plant the following December. Both manufacturers gave us incredible and relatively unrestricted access to their truck plants resulting in two of the most exciting stories we’ve ever published. You can read both articles in our Factory Tour section. To say that the GM and Ford truck plants were impressive would be a ridiculous understatement. The sense of pride and commitment from the American teams was incredibly strong and the technology, robotics, and multiple layers of quality control were stunning at both facilities. Based solely on our factory tour experiences, we would be honored to own a truck from Ford or GM. Take a tour through an American truck factory for yourself and you’ll know exactly what we mean. When it came time to choose between the Ford Super Duty and Chevrolet Silverado HD trucks, the trucks themselves, and our personal preferences, made the decision. In short, Angela and I both preferred the ride quality of the Chevy Silverado HD. Specifically, the steering, handling, and braking was more comfortable and confident in the Silverado HD. Angela said she felt more in control driving the Silverado HD. Since Angela drives the truck most of the time, this was very important. Of course this is a very subjective evaluation based on our personal preferences and experience. We would have been very happy with a Ford truck and have actually owned four Ford vehicles including our current 2009 Ford Focus. In the end, the ride quality of the Silverado HD was a better fit for us. During our truck research, we contacted both Ford Motor Company and General Motors corporate for assistance with our truck build. While Ford Motor Company did respond, it was General Motors who gave us immediate and open access to senior product and marketing team members. The GM Silverado team worked closely with us over several weeks of intensive back and forth communications as we designed this truck from the ground up, feature for feature, and option for option, always keeping the payload capacity in our sights. The benefits of this exchange are already bearing fruit. For example, GM has agreed to an article with Truck Camper Magazine to explain how truck payload capacities are determined. The implications of this information are far reaching and have the potential to fundamentally improve our understanding of truck and camper matching. There is tremendous promise in working with the major truck manufacturers and we are very excited at General Motor’s demonstrated interest and support for the truck camper industry and community. We want to thank GM for their invaluable assistance and look forward to continuing our exchange of communication. Hopefully Ford Motor Company and the other major truck manufacturers will soon follow suit. 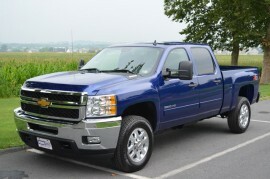 Above: After working with GM corporate, our local Chevrolet dealer, Hondru Chevrolet, helped us place our truck order. Thank you Hondru Chevrolet; (left to right) Valentino Conte, Sales Manager; Shana Hockenbberry, Business Manager; Marshall Tellez, Sales Representative; and Angela White, Editor, TCM. Our 2012 Dream Truck Survey was clear; most of you, 78.99% to be exact, prefer diesel engines. And truth be told, we have really enjoyed our 12-valve Cummins diesel. I’ll never forget when Angela first drove our Dodge diesel and said, with a devilish grin, “Now that sounds like a real truck”. Of course I couldn’t really hear her over the growling 12-valve Cummins diesel, but that’s another story. The decision for a gas truck was dictated by our need to maximize payload, and the considerable cost of the Duramax 6.6L turbo-diesel ($7,195). Diesel engines are heavier than gas engines and significantly reduce the available payload of most truck configurations. It’s amazing how hard the choice of gas or diesel hits you in the pocketbook and payload, right where it counts. The pro-diesel counter argument would be for the improved power, torque, fuel efficiency, engine longevity, and resale value of a diesel. We agree with all of those points, but ultimately decided to chose the 380 horsepower, 380 lb-ft of torque Vortex 6.0L V8 gas engine to keep the payload up, and the cost down. For the record, we have been very impressed with the new Ford 6.7L Power Stroke turbo diesel engine. It’s powerful, efficient, and remarkably quiet. We haven’t had the opportunity to drive a current Duramax, but hear good things from our readers about GM’s diesel as well. I can honestly see us returning to a diesel engine in the future, especially if we return to a long bed dually. In the meantime, Harley, our cat, is devastated that his beloved purring diesel is gone. He’ll get over it. The long bed versus short bed battle raged heavy at Truck Camper Magazine headquarters right up to the point of ordering the truck. The primary concern we had was whether we would be limiting our truck camper model options by going with a short bed truck. When we checked our Buyers Guide, we counted 56 long bed, hard side truck campers and 36 short bed, hard side truck campers. We will also be using our new truck for pop-up truck campers and counted 21 long bed, pop-up truck campers and 20 short bed, pop-up truck campers. While the nearly identical pop-up truck camper numbers are a wash, clearly we would have more (55.5% more) hard side truck camper model options with a long bed truck. So why on Earth did we go for a short bed truck (called a standard box by GM)? Well, statistically, short bed trucks outsell long bed trucks. As a magazine charged with growing the truck camper marketplace and community, it makes sense for us to demonstrate and promote truck campers with the more popular type of truck bed. But that’s not the real answer. The real answer is we wanted a shorter and narrower truck that we could park in front of our townhouse condominium and comfortably use as a daily driver. Our home owners association doesn’t allow dual rear wheel trucks in our neighborhood and we were sick of keeping our truck in a paid storage lot a few miles away. For this reason, a short bed, single rear wheel truck was almost mandatory, but we were also ready for a smaller truck after five years with our long bed, dual rear wheel, and exceptionally tall Dodge Ram 3500. In a few years we’ll probably go back to a long bed truck, but we’re really excited about living with a short bed truck, and experiencing the world of short bed truck campers. This is probably the sorest and most sensitive topic on the list, for us. We would have strongly preferred an extended cab truck, but GM doesn’t offer an extended cab for their heavy duty short beds. Ford does, but for some reason GM does not. When I asked GM to make one just for us, they said no. When I begged, pleaded, and generally threw a make-me-an-extended-cab-short-bed-heavy-duty-Silverado-you-big-meanie tantrum, they still said no. As the Rolling Stones sing, “You can’t always get what you want”. You got that right, Mick. The reason why we wanted an extended cab was to keep the overall length of the truck, and thus the camper rig, to a minimum. We talked about a regular cab, but we need the storage of an extended or crew cab to compensate for the storage we could lose going from long bed truck campers to short bed truck campers. Regular cab trucks can also be awkward with truck campers, both aesthetically and in terms of the visibility of street lights. Like a baseball cap, the cabover of a truck camper on a regular cab truck blocks your ability to see what’s up, and right in front of you. Crew cab it is. Above: The 2013 Chevrolet Silverado HD 3500 interior. Click thumbnails to enlarge. With our “Go Anywhere/Camp Anywhere” motto, you might assume that choosing four wheel drive was easy, and you would be right. With red hot truck camping destinations like Assateague Island National Seashore requiring four wheel drive, there really was no question that we would be getting four wheel drive. That said, we have never once put our Dodge Ram 3500 in four-wheel drive. We did put the 2011 Ford F-350 loaned to us by Lance Camper for Angela’s Warrior Dash into four-wheel drive for a minute or two, but that was to get out of a mud patch in the middle of a wet field. That’s the only time we have used four-wheel drive in our seven years of truck camping, including three cross-country trips, and many other long and short distance truck camping adventures. Furthermore, we have been told by several extremely experienced and well traveled overland truck camper users that they too have hardly ever used four-wheel drive, if ever. Perhaps having four-wheel drive is like having air bags; you don’t need the feature until you do, and then you really need it. To keep things in perspective, we are dead set in getting this new truck as far off the pavement as our nerves will allow. Where our old truck almost never left pavement, the new truck will tested on sand, gravel, dirt, rock, and whatever else we can get under our tires. Find us a Jello trail and we’ll try it. You’ll help pull us out, right? This question was answered the second we decided on a short bed truck as neither GM nor Ford currently offers a dual rear wheel short bed truck. We also wanted to design a truck that would be well suited for off-road travel. Our 1998 Dodge Ram 3500 had six Rickson 19.5” wheels and steel wall tires, a dream for long distance highway driving, but completely inappropriate for soft sand or extended off-road use. The main reason 19.5” steel wall tires are not recommended for off-road use is the fact that they don’t air down well and have been known to “pop a bead” on the sand. Go anywhere? We’ll find out. It was pure comedy when we went to our local Chevrolet dealer, Hondru Chevrolet in Manheim, Pennsylvania, and we had to actually select the color of our new truck. After six years with our charcoal grey Dodge truck, Angela put her foot down. “I want a blue truck,” she said. She wasn’t kidding. The problem was that Chevrolet had a new blue color for 2013 called Blue Topaz and we wouldn’t actually see the color until our truck arrived. Angela was undeterred. I eventually caved and said, “What the heck, let’s get a truck in a color we’ve never seen”. With that decision, we leaped together into the blue unknown. During the weeks that followed, Angela would point to just about anything blue and say, “I think it’s going to be that color blue”. She won’t admit it, but she was as nervous about the mystery blue as I was. When the truck arrived, we were delighted with the bold blue color. One thing is for certain, there’s no mistaking this truck for charcoal grey. It’s Blue Topaz, with pizazz! It’s absolutely insane how many choices there are when buying a truck. This article is already seven pages type-written and we haven’t even reached the trim, wheels, and the many other possible options. When it comes to ordering a new truck, there’s no, “Number three, super-sized, to go”. This is when we really started to work closely with the GM Silverado team to find out what each option and combination of options weighs. Our goal was to assemble an off-road ready truck that, while still luxurious, maximized the possible payload. With GM’s finite analysis, we hit our mark. For packages, we ordered the Z71 Off-Road Suspension Package ($200), the Snow Plow Prep Package ($285), and the Interior Plus Package ($720). The Off-Road Suspension Package gave us upgraded shock absorbers, a front stabilizer bar, jounce bumpers, and a frame mounted front skid plate. The Snow Plow Package improved our payload and gave us an upgraded alternator. The Interior Plus Package gave us a six-way, power driver side seat, an upgraded stereo with USB port, Bluetooth for hands-free cell phone use, steering wheel mounted audio controls, dual-zone air conditioning, and fog lamps. Other options we chose include power sliding rear window ($250), 18” Michelin LTX A/T2 all-terrain black wall tires ($150), and camper/5th wheel trailer wiring provisions ($35). There’s more detail to the option list, but those are the most important choices. With options, our 2013 Chevrolet Silverado 3500HD 4WD Crew Cab 153.7” SRW LT truck came to $45,435. After offers and incentives, we paid considerably less, but it was still a very big purchase for us. So there you have it, our reasons for purchasing a 2013 Chevrolet Silverado 3500, gas engine, crew cab, short bed, automatic, four wheel drive, single rear wheel truck in knock-your-socks-off Blue Topaz. It’s the right truck for us, and we hope our decision process will help you to determine what the right next truck for you will be. Did Someone Ask About the Payload? You didn’t think we would finish this article without mentioning the payload, did you? Not bad for a crew cab, short bed, four wheel drive, single rear wheel truck. Copyright © 2007-2012 Truck Camper Magazine. All rights reserved.